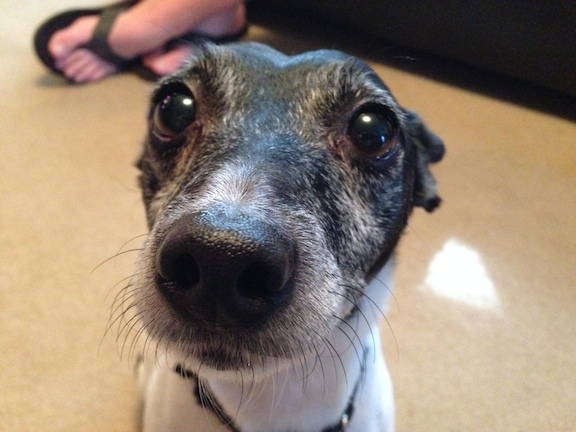 Meet Eddie, a seven-year-old Rat Terrier who was barking at and being somewhat anti-social to his owner’s boyfriend. Shortly after sitting down with Eddie and his owner, I watched the dog walk over and sit down right next to his owner’s boyfriend. She mentioned that location was Eddie’s “safe place,” and that he lay there often. This was unusual as a dog generally will not sit or lie down next to someone they are not comfortable with, safe place or not. When Eddie’s owner struggled to come up with any rules that he was expected to follow, it validated my suspicion that Eddie considered himself equal to the humans of the home. To change that perspective, I demonstrated a leadership exercise that will help Eddie see his owners as being in a leadership position. The exercise involves the dog understanding and accepting the fact that it is not allowed to take the high-value treats laying in the middle of the floor until he gets permission from a human. It only took me two minutes to teach Eddie the exercise. After I did so, I walked all the members of the house through the exercise with equal success. I suggested that they continue to practice this exercise over the course of the next week or two to really reinforce the leader follower dynamic that they want to achieve. I also suggested a number of small rules and boundaries that they could incorporate to help remind Eddie where his place is amongst the humans living in the house; Not allowing the dog to sit at the same height as the humans helps the dog see a distinction between them. Asking a dog to sit or lay down before receiving affection is a great way to make the reward or affection more valuable and important to the dog. Next I went over some basic methods of communication. Many of my clients use multiple or variation of words when communicating with their dog. I always get a laugh from my clients when I tell them that dogs don’t speak English. The fact of the matter is dogs hear the sound of a word, not the comprehension of the word itself. So when different members of the family use different command words, this makes it more difficult for the dog as it has to remember a larger vocabulary than is necessary. In Eddie’s case, one of the owners said “come,” another said “Eddie come here” and another one said “over here Eddie.” By consolidating things and always using the same single word command of “come,” we can make it easier for the dog to understand what we are asking or telling it. In addition to consolidating the list of command words, I showed Eddie’s owners how to communicate with him nonverbally using their body language. This is the native tongue for dogs and I have found that once owners start using this method of communication, the dog’s behavior improves dramatically. Eddie was no exception. He started reacting immediately when asked to get off the couch, to sit or recall. By using these nonverbal methods of communication, his owners will develop a better relationship and understanding of the rules, boundaries and expectations they have for the dog. By the end of the session, Eddie much calmer, was responding to his owner’s boyfriend’s commands and even taking treats out of his hand. I suggested that he also take the dog out for short walks as often as possible, preferably at least once a day. When a dog walks in a structured heel position with a human, it’s a great bonding experience for them both. Because dogs enjoy the activity, this is a great way to incorporate positive reinforcement to help recondition the dog to enjoy the presence of the boyfriend.